Russia is situated in the east of Europe and the north of Asia. It is contiguous with 14 states and has the longest borderline in the world. Its territory is 17,075,400 sq. km. Russia's climate is very diverse, ranging from sub-tropical at the Black Sea to extremely continental in Siberia, where the temperature drop within a year may exceed 100°C, and arctic in the Far North; but most of the country lies within the zone of temperate climate. There are 11 time zones in Russia. The time difference varies from +2 hours in Kaliningrad to + 12 hours in Kamchatka and Chukotka with respect to the Greenwich Time. The time in Moscow and St. Petersburg is GMT +3 hours, Ekaterinburg (GMT +5 hours), Novosibirsk (GMT +6 hours), Krasnoyarsk ( GMT +7 hours), Irkutsk ( GMT +8 hours), Chita ( GMT +9 hours), Vladivostok ( GMT +10 hours). The Russian Federation includes 21 republics, 6 territories, 49 regions, 1 autonomous region, 10 autonomous districts, and 2 cities of federal subordination: Moscow and St. Petersburg. The capital of Russia is Moscow (about 10 million residents). The largest cities (above 1 million) are: St. Petersburg (4.6 million), Novosibirsk, Nizhny Novgorod, Ekaterinburg, Samara, Omsk, Chel'abinsk, Kazan', Perm', Ufa, Rostov-on-Don, and Volgograd. There are about 143.3 million people in Russia (the data of 2002), 80% of whom are Russians (Slavs). 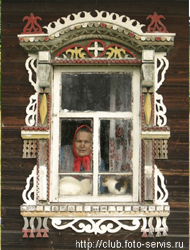 Besides, more than a hundred different national and ethnic groups live in Russia. The most numerous of them are Ukrainians and Tatars, as well as Armenians, Azerbaijanians, Kazakhs, Hebrews and Germans. The official (state) language throughout the whole territory of the Russian Federation is Russian. Monetary unit is ruble (RUR). About half of the Russians are atheists. 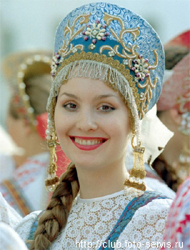 Most of the believers are Orthodox Christians (the eastern branch of Christianity). Islam, Catholicism, Judaism, and Buddhism are also practiced in Russia.